The Interventional Cardiology Department at First Coast Heart & Vascular Center offers a wide spectrum of diagnostic tests and non-surgical minimally invasive interventional treatments for patients with cardiovascular diseases such as coronary artery disease, heart valve disease, and peripheral artery disease. Interventional cardiology refers to a variety of non-surgical minimally invasive procedures for treating cardiovascular disease. Interventional cardiologists use catheters – thin, flexible tubes- to go inside blood vessels to perform diagnostic tests or to repair damaged vessels or other heart structures, frequently avoiding the need for surgery. 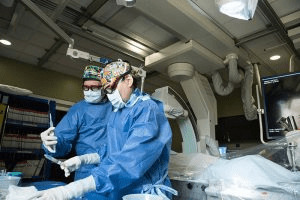 The board-certified interventional cardiologists at First Coast Heart & Vascular Center perform non-invasive, catheter-based procedures, including angioplasty and stenting or coronary and peripheral and carotid arteries, closure of ASD’s and PFO’s, trans-catheter aortic valve replacement (TAVR), and left atrial appendage closure. They lead a team of experienced nurses and specially trained technicians providing high quality, innovative care for patients requiring minimally invasive percutaneous interventions. This clinical expertise is enhanced by the team’s access to the best in medical technology at our Cardiac Catheterization Laboratory, a state-of-the-art facility located in Jacksonville, FL. Patients can make an appointment with one of our Interventional Cardiology specialists by calling (904) 423-0010.